Caleb Davis Bradham, a pharmacist in New Berlin, North Carolina, was known for his fountain drink concoctions. In 1896, one of his creations became so popular that it came to be known asBrad's Drink. In 1898, Brad's Drink was sold in the market and Bradham, along with some partners, worked to sell Brad's Drink to other drugstores. 1902 marked an important year for Bradham. It was then that he filed incorporation papers with the stated of North Carolina. To sell Pepsi-Cola and to manufacture and deal in soda fountain drinks and specialties. 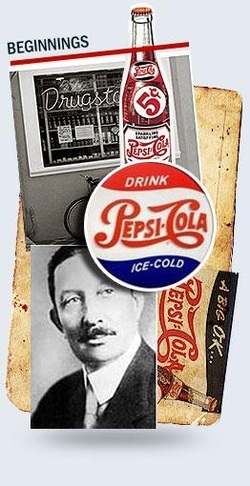 The name Pepsi was believed to be derived from the word pepsin, an enzyme that aids digestion. But Pepsi does not contain this enzyme.